The proposed bill envisages fines of up to $15,000 and a prison term of up to five years for denying the Red Army’s role in “maintaining international peace” and “dissemination of deliberately false information” about the Red Army. Russia’s lower house of parliament will consider a bill which would outlaw criticism of the Red Army’s actions during World War II and attempts to “rehabilitate” Nazism, a Russian lawmaker said on Monday. Also covered by the bill are attempts to criticise the outcomes of the 1946 Nuremberg Trials which sentenced the key leaders of the Third Reich to death or jail, or criticism of the Allied forces actions during the war. Irina Yarovaya, a member of the Kremlin’s United Russia party, submitted the new bill, which aims to prevent attempts to re-assess the Red Army’s role in fighting Nazi Germany and its allies. She reportedly said such attempts “contradict historically objective information" such as the United Nations Charter which bans justification of Nazism. Yarovaya has supported some of the most controversial bills passed by the State Duma in recent months, including a law banning adoptions of Russian children by US nationals and another punishing those who offend “the feelings of believers” by fines and prison time. The proposed bill is an apparent step to counter politicians and activists in former Soviet and Communist bloc nations who have criticized what they claim are war crimes by the Red Army, such as executions and mistreatment of prisoners of war and civilians, mass deportations and rapes in Eastern Europe, Finland and Germany. 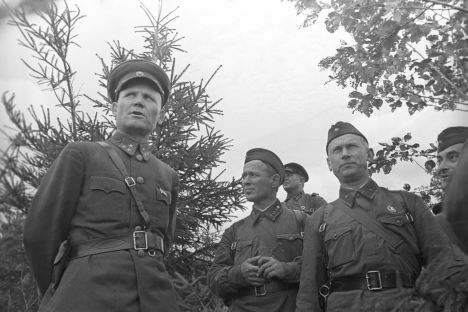 One such war crime, the 1940 execution of more than 22,000 Polish soldiers by the NKVD, the Soviet secret police in the Katyn forest in 1940, has for decades strained relations between Moscow and Warsaw. The Soviet government insisted for decades that the officers were killed by the Nazis and their allies, and only in 1990s admitted that Soviet dictator Joseph Stalin had ordered the massacre. Russia has tried to atone for the crime to Poland in recent years, with President Putin honoring the victims at remembrance ceremonies. Stalin also orchestrated mass deportations of several ethnic groups in the Soviet Union during the war, including the Volga Germans, Chechens, Ingush, Balkars, Crimean Tatars and Black Sea Greeks whom he accused of collaborating with the advancing Nazis. Most historians say those claims were false or grossly exaggerated, and think the real reason for the deportations was the resistance to Soviet rule by some ethnic groups in the Caucasus. Russian politicians were outraged in 2002, when British military historian Anthony Beevor published his book “Berlin” about the campaign to take the German capital in 1945. Beevor claimed the Red Army carried out millions of rapes of German women as it advanced across the Reich in 1944-45, and even frequently attacked Russian and Polish women. Moscow’s then-Ambassador to London, Grigory Karasin, condemned the book as “an act of blasphemy” and “slander,” The Daily Telegraph reported. In May, Leonid Gozman, a Russian politician and head of a government-run corporation, lambasted a 2009 television series that glorified Smersh, part of Stalin’s secret police and said that the “beautiful uniform” worn by Nazi Germany’s SS was the only difference between them and the NKVD. Duma lawmakers and Jewish activists condemned Gozman’s remarks and initiated a move to ban such statements. In recent years, the Kremlin has endorsed and funded a string of films and television series celebrating secret services such as the KGB and military intelligence. Some of the films were fiercely criticized by historians and liberals as “justification” of Stalin’s policies. A Russian television personality and human rights activist said that the new law might affect research dealing with World War II and its outcomes. “One won’t be able to critically approach anything – Stalin’s crimes, Gulag, deportations of ethnic groups, the horrible mistakes [of Russian generals] made on the frontlines,” Nikolai Svanidze told RIA Novosti. Revisionist historians in the West have in the decades since the war criticized some aspects of the Allies’ conduct of the campaign, including Britain’s policy of area-bombing Germany and the United States' use of nuclear weapons against Japan.